I’m not mincing words – pork gets skewered! The pork mince from Footscray market is cheaper and of a better quality than anything you might find on a plastic tray in the supermarket meat display. I find, when buying meat from the market, that it pays to have a quick look at all the stalls from a distance first, comparing prices and quality as you go, before returning to your stall of choice to make your purchase. This way you avoid being accosted at every stall when you are only looking. I bought 1/2 a kilo of pork mince for a couple of dollars and gathered some Vietnamese aromatics and flavorings from the vegetable and grocery stalls. With this I made these tasty skewers. Combine pork mince with all other ingredients in a large bowl. Using clean hands, mix until all ingredients are incorporated. Cover and refrigerate for 30 mins. Take small amounts of the meat mixture and mold onto skewers. Grill until nicely browned and cooked through. Combine dipping sauce ingredients and adjust to taste remembering to check the balance of hot, salty, sweet and sour flavours. 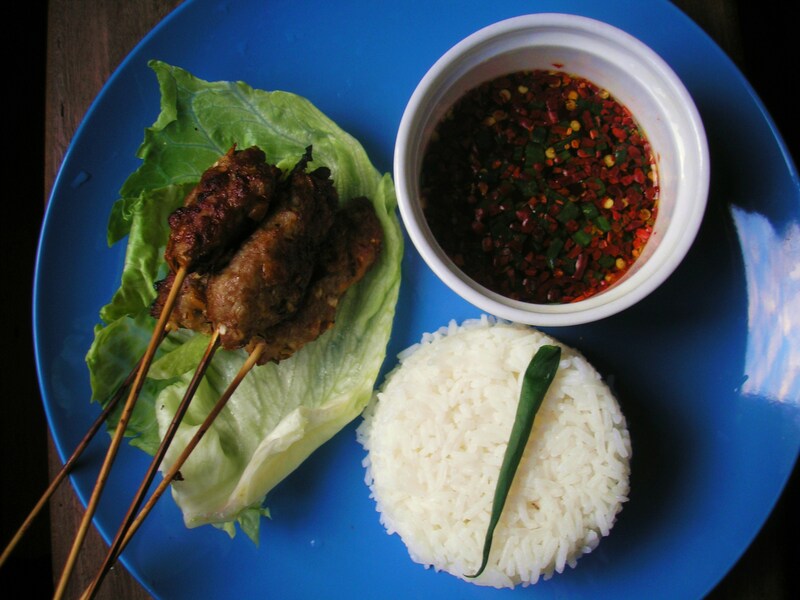 Serve pork skewers with iceberg lettuce for wrapping, dipping sauce and jasmine rice. No, I haven’t suddenly started gambling on the stock exchange, the investment I made was of a more humble nature – it was a 1.5 kg piece of beautiful, meaty pork belly from Footscray Market. I was eager to try the twice cooked method, where the meat is either steamed or braised for a couple of hours and then finished off on a roasting tray in the oven. I wasn’t aiming for the skin to be too crispy as this is not how the Chinese serve it, the texture is more gelatinous and a bit chewy. If you wanted to crisp the skin a little more you could put it under a grill briefly being careful not to burn it. 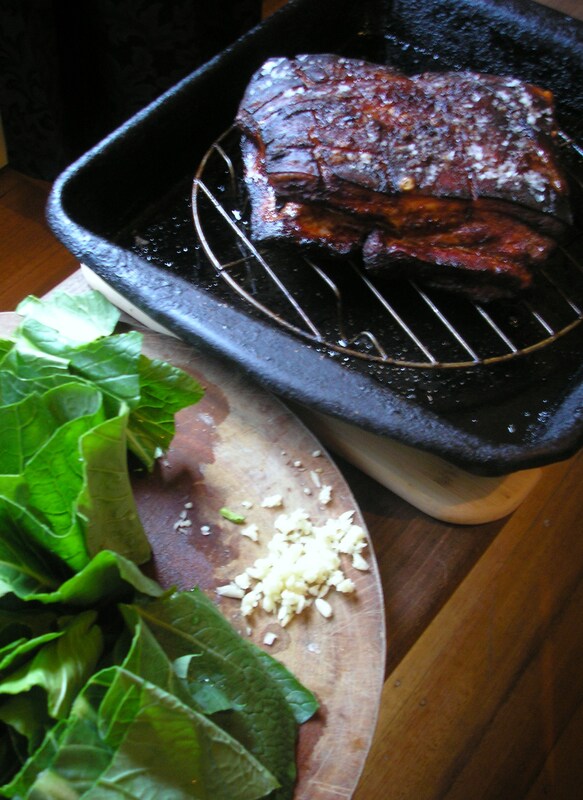 The result I achieved was meltingly tender and very tasty, I served it with rice and braised Pak Choy but you could serve it with and an Asian ‘slaw’ or sliced with condiments and coriander on a white roll like the famous Vietnamese pork baguettes. In a ceramic baking dish, mix together all ingredients for the marinade. Combine well. Place the pork fat side down in the marinade and then turn it over making sure the whole piece is well coated. Turn over again so that it is fat side down and spoon some marinade from the sides over the piece of meat. Cover with cling film and refrigerate for at least 4 hours. Pre-heat oven to 180°C. Remove cling film from dish, turn the meat over again so it is fat side up. Pour a half a cup of water or chicken stock into the dish and cover with aluminium foil. Place on the middle shelf of the oven and roast for 2 hours turning the baking dish occasionally. Remove from the oven and transfer the meat, fat side up to a metal baking dish with a cake rack in the bottom. Sprinkle the skin of the meat with some sea salt. Turn the oven up to 200-220°C (depending on your oven) and place the meat on the top shelf. Roast for a further hour turning the baking dish occasionally and checking to see that the skin does not burn (the skin will be quite dark due to the marinade). Slice and serve with your choice of Asian side dishes.